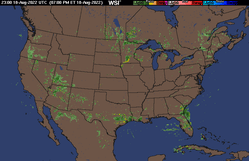 The NOWRAD Radar Summary maps are meant to help you track storms more quickly and accurately. 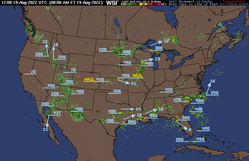 These maps consist of echo top heights, cell movement indicators, tornado and severe thunderstorm watch boxes, and the NEXRAD Storm Table information overlaid onto the mosaic radar imagery. The radar summary graphics display cell movement and direction by arrows, with speed in knots, and the echo top heights in hundreds of feet. An 'NA' on the chart indicates that the radar report from that station was 'Not Available', and 'NE' shows that the radar was seeing 'No Echos'. Severe weather watch boxes are also plotted - red boxes indicate a Tornado Watch has been issued for the area, and a blue box indicates a Severe Thunderstorm Watch is in effect for the area. 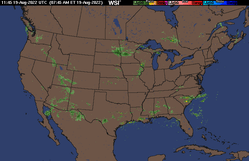 The NEXRAD algorithms detect a three dimensional rotating section of a storm that is an indicator of severe weather. Potential tornadic activity is detected by the NEXRAD algorithms within the mesocyclone. The NEXRAD algorithms are detecting the probability of hail within the storm. The radar observation (ROBs) is detecting a hook echo, which is an indicator for potential tornadoes. Thunderstorm and tornado watches issued by the Storm Prediction Center in Norman, OK.